Air pollution is not good for you or me. Our current elected officials may say otherwise, but global warming is real and we can thank air pollution for that. And now we can thank it for the diseases it can cause. In 1948, a little town in Pennsylvania awoke to an unusually sooty sky. This area was notable for its daily haze coming from the nearby zinc and steel plants. This was the price to be paid for feeding your loved ones. The next day, the smog was so bad that the local high school quarterbacks couldn’t pass the ball to the receivers. For five days, Donora, Pa. was filled with so much smog that 20 people were killed, one-third of the town was sick, and another 50 died in the coming months. After the tragedy, the federal government began clamping down on pollutants, leading to the Clean Air Act in 1970, 22 years after the events in Donora. Whatever the case may be, the evidence is there. Air pollution can cause more than global warming; it could affect your life. In the past few weeks, we have heard about three major hurricanes threatening and devastating parts of the U.S. on the coast. Hurricane Harvey has devastated much of southern and eastern Texas. Hurricane Irma moved up the west coast of Florida, covering the entirety of the state (it was over 450 miles wide), and Hurricane Jose is threatening the Caribbean islands after Irma has already caused a great deal of damage there. I am sure everyone is hoping that the hurricanes do as little damage as possible and that hopefully, no one will die because of them. However, we need to take a look at the cause of three massive hurricanes happening almost all at once. Global warming, or global climate change as it is more accurately called these days, is the ultimate cause of these hurricanes. Global climate change specialists have warned of increases in greenhouse gas emissions causing an increase in hurricane frequency and severity. The Geophysical Fluid Dynamic Laboratory (GFDL) says that while they cannot yet determine for sure if human greenhouse emissions are the cause, they say that it is very likely, and they have the data to back the trends that strongly indicate global climate change is causing an increase in hurricanes (1). If we want to avoid increasingly dangerous hurricanes, we as a society need to pay more attention to our effects on the environment. We need to put a greater effort into combating the effects of global climate change and reducing greenhouse gases. Scientists have developed the technology of using natural resources to create electricity. We can and should implement this technology to help reduce our carbon footprint. If we do this, we can help reduce the severity and frequency of the types of hurricanes we have been seeing. This will help save lives because then people will not be in danger from such massive hurricanes as often. Most people are probably enjoying the warm and sunny weather that Radford University has been having lately. Temperatures in 60’s and 70’s, a nice bright sun to keep you warm, a cool breeze every now and again; it’s great weather for sitting on Heth lawn and relaxing. In fact, that’s what many people have been doing. We’ve had quite a few people in shorts and t-shirts (or even just shorts) outside enjoying the weather and playing games; they’ve been all over campus. The only problem is that it’s the middle of February, and the weather should be freezing with ice and snow, not warm like it’s the middle of spring. The unusual weather is due to the effects of global climate change, which is becoming a bigger and bigger problem. Some people do not believe that this drastic change in climate is even real, despite the amount of evidence for it (1). Firstly, we need to get rid of a common misconception and frequently made argument against climate change. There is a difference between climate and weather. The weather is whether or not it is sunny or rainy outside, or warm or cold, on that specific day, while climate is part of the specific environment of an area. If you are in a desert then you have very hot temperatures, and if you are in the Artic then you have very cold temperatures. The issue is that these temperatures are steadily increasing to the point that these environments are becoming uninhabitable. A particularly cold day or cold season does not mean that climate change is a hoax; some of the gasses that we have added to the atmosphere have created an ozone hole over the South Pole, causing that part of the stratosphere to become colder. This colder stratosphere causes faster winds that reach as far as the equator which then affect tropical circulation and rainfall (2). Global climate change is due to the increasing emissions of greenhouse gasses in our atmosphere. These gasses absorb and hold onto the heat that we receive from the sun, so the more we put into the atmosphere, the warmer our planet gets. This is a real problem; glacial ice is melting and subsequently causing sea levels to rise. This means landmasses that are close to the sea level will be wiped out. Environments are getting destroyed due to the increasing climates and sea levels. We are hurting ourselves by ignoring this issue, and something needs to be done soon before it is too late. Climate change is becoming a huge issue that even some of the biggest skeptics are starting to accept as fact. As scientists scramble to find a solution, or to at least prepare the world for the effects of climate change, there are a few key pieces of information that scientists are stressing to the public. 1. New York City is almost certainly screwed. Hurricane Sandy has motivated researchers to figure out how much time NYC has to prepare for another disaster like Hurricane Sandy. However, as hurricane season has two more months, there are plenty of worries as to what the city can withstand. 2. Even with global calls for reduced greenhouse gases, we’re still screwed. Every country except for India has prepared a plan to reduce emissions to present at the United Nations in December. The hope is that with a global deal to reduce emissions, countries will be able to hold each other accountable in their efforts to save the planet. However, scientists believe that even with these deals, it may be too far gone. The global average temperature will still rise by 6 degrees Fahrenheit, analysts say. This could cause mass extinctions of animal and plant life, and will certainly cause mass food shortages. In short, this increase would be catastrophic. In 2010, a goal was set to lower the expected global temperature rise to 3.6 degrees Fahrenheit, according to the New York Times. Although this rise in temperature would still allow significant levels in sea rise, agricultural issues and obviously harm the environment, it wouldn’t be nearly as catastrophic. 3. Melting ice is revealing some scary relics. Along with well-preserved Woolly Mammoths and fossils of never-before-seen creatures, melting permafrost is revealing some giant viruses. These “giant” viruses are called such because they are the size of bacteria. Although many of these viruses are harmless to modern-day species, scientist worry that we could potentially re-awaken viruses such as smallpox. There’s little known about what can be found under the permafrost. Scientists worry that as the permafrost melts, we could face a global crisis, much like the plague. 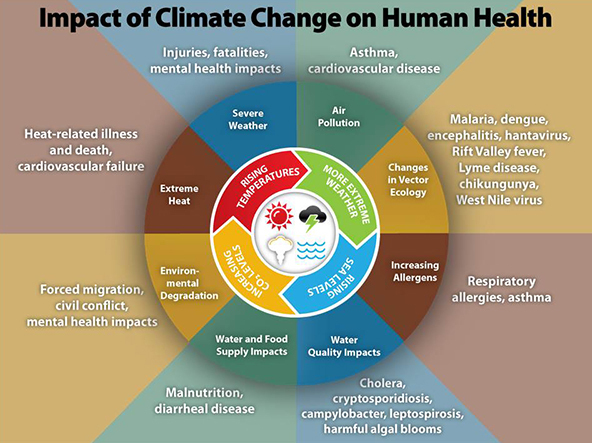 Overall, climate change has many negative effects. Scientists are still fighting to save the planet, but we also must be prepared for the possibility that it’s too late and we need to be prepared. climate changeglobal warminggreenhouse gasesrising sea levels. The existence of climate change has been a hotly debated issue in the not-too-distant past. At least, that’s how it went for most of the world. Unfortunately, headlines have been telling a different story about Floridian politicians. You can’t sound more ridiculous than shouting the world is flat. Why? It isn’t because every person has walked completely around the entire world to test the theory. We trust our scientists to do their research and fact check one another. After enough of a percentage say they tested it and found that they were able to disprove the flat earth theory, the popular belief is that the world isn’t flat. But despite this, Florida’s own DEP (Department of Environmental Protection) has gone and created a censorship on climate change. Barton Bibler, an employee of Florida’s DEP, was required by his administration to take a leave of absence and complete a mental health evaluation for using the terms “climate change” and “global warming” in a presentation on March 2. Apparently, Bibler was unaware of the off-the-record ban on both of the terms, which has been enforced since Governor Rick Scott took office in 2011. When asked about the reason for Bibler’s punishment, Scott’s office stated that there’s no such policy and Bibler had been reprimanded due to his performance, insubordination, and behavior which was not becoming of an employee of the DEP. However, a former DEP attorney stated that more than a dozen complaints had been reported by DEP employees on this topic in the last five years. Regardless of the proof of a real policy or simply an atmosphere of fear and hostility in Florida’s DEP, the state should be concerned about how the reality of climate change is affecting them. Miami Beach alone is victim too unusual flooding and dying coral reefs — which are a major tourist attraction and source of revenue. And, despite being nicknamed the Sunshine State, Florida is behind dreary, cold Massachusetts, as well as California and Nevada, in solar power. In fact, it’s illegal for homeowners to rely entirely on individually produced electricity. Bibler’s punishment for his presentation — whether due to his use of censored terms or not — is a wake up call for the state. If Florida’s DEP is afraid to talk about climate change, it doesn’t bode well for the future of the state. Saving the environment is on the minds of people all over the world these days. Many have heard the phrase, ” reduce, reuse, recycle,” but did you know that it could save you money as well as save the Earth? Saving money is always on the minds of college students. There are many ways to help the environment, from volunteering to recycling, that are simple and beneficial. The good news for us is that saving the environment can save us money too. Here are some easy ways to go green and save green brought to you by, Worldwatch.org, savvysugar.com and wisebread.com.